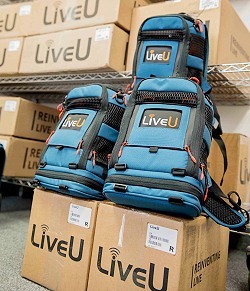 LiveU announces major deal with Sinclair Broadcast Group. Hackensack, NJ, January 2019: Sinclair Broadcast Group has signed a multi-year lease agreement with LiveU that upgrades its fleet of hundreds of portable transmission units to LU600 HEVC for its newsgathering operations, ensuring the media company always has the latest bonded IP technology. The agreement immediately upgrades Sinclair stations spanning 80 production locations in the US to LiveU’s flagship model of HEVC field units featuring higher efficiencies, greater stability, increased reliability and the best video quality in low bandwidth situations.